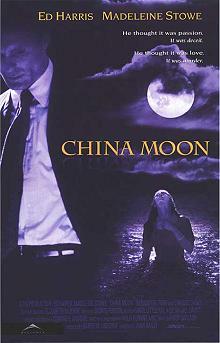 A brilliant detective, an unfaithful wife, an abusive husband, a night under the china moon. When Detective Kyle Bodine (Ed Harris) meets the beautiful Rachel Munro (Madelaine Stows) he is swept away. He is the man who will catch murderers no matter how clever they have been. Now, he must use all his skills to hide the murderer. China Moon is, hands down, one of the best movies I've ever seen. It is modern Film Noir, with the honest but love-smitten detective and the beautiful femme fatale. This is the film that turned your humble reviewer from an admirer to a full-fledged Ed Harris fan. He is remarkable as an everyman caught in a trap that is closing, closing. He must avoid the inexorable progression of his sidekick (Benicio Del Toro), and somehow extricate himself and his love from the consequences of her actions. Well-performed, well-paced, and fascinating. This is crime at its best, compelling and moody and quietly fascinating, without the artificiality of loud noises and fast cars to try to fool the audience into thinking the story is exciting.